Departure for the city of Puebla (123 kilometers from Mexico City), a 2-hour drive. Arrival at the main square of the so-called “City of the Angels”, where some of the best examples of religious architecture from Mexico’s colonial era can be admired. Visit to the Cathedral, the Rosary Chapel, an architectural jewel from the XVIII century, going through El Parian (handicrafts market) and countless houses built around that same time. 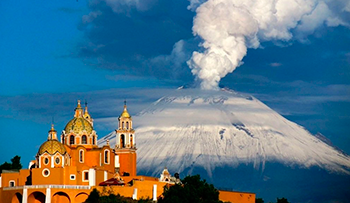 Departure for Cholula, some 12 kilometers or 20 minutes away. Visit to the great Pyramid, one of the largest and most important Choluteca culture monuments in the Americas. – Regular services and fare guaranteed only on Tuesday, Thursday and Saturday with minimum 4 passengers.